Be the talk of the town with Cirros Milan's Unisex white high-tech ceramic watch. The watch displays a mother of pearl dial infused by 12 crystals and accented by silver toned hour, minute, and second hands. Elegant, stylish & well-engineered. Be the talk of the town with Cirros Milan's Unisex white high-tech ceramic watch. 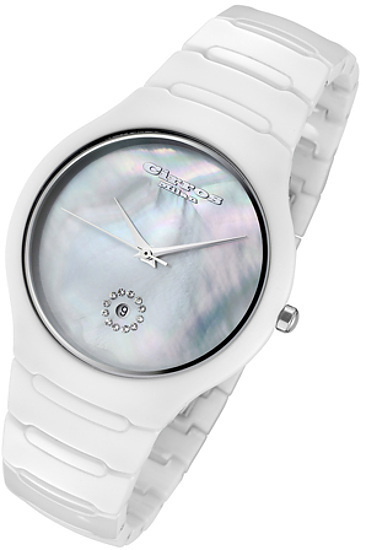 The watch displays a mother of pearl dial infused by 12 crystals and accented by silver toned hour, minute, and second hands. Elegant, stylish and well-engineered - Ensuring accurate timing, the watch is equipped with a Japanese quartz movement. The watch also features a scratch-resistant sapphire crystal and has been tested for water resistance up to 3 ATM / 30 Meters / 99 feet. This watch comes in one size and is made to fit a wrist with a circumference of 201 mm / 7.93 in, but it can be resized to any wrist. With a 1-year warranty, this watch is ideal for formal wear, business and casual attire!